The Vikings made their preseason debut and it was the first opportunity to evaluate players in live action. Daniel House takes you inside the film room to find this week's winners and losers. Updated: August 14, 2017, 5:00 p.m. 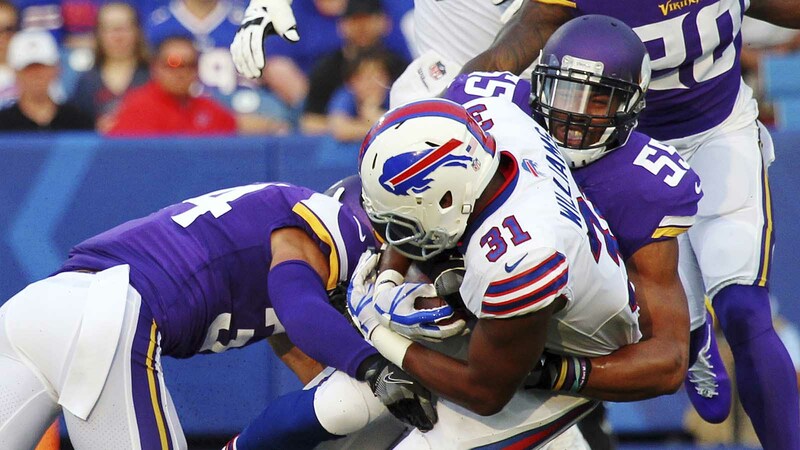 The Vikings' offense lacked any identity during the three series they were on the field against the Bills. They tallied just 24 yards and one first down during their short stint of action. However, within the first few plays, everyone saw the dynamic weapon running back Dalvin Cook can be. He had two strong runs out of the shotgun, one of which required him to be patient and fend off tacklers. He added a reception out of the backfield and looked smooth as he tracked the pass into his frame. It certainly will be an added bonus to have a versatile running back like Cook at the team's disposal. It is clear to see Cook will be an active weapon in the screen game when he can get to the edge with the ball in space. He was one of the lone bright spots on the first-team offense. Quarterback Sam Bradford needs time to throw down the field to maximize his overall arm talent and accuracy. However, he must be more willing to sling passes when opportunities are available. There were two instances where he checked down on third-and-long, leading to punts. It is worth noting the limited amount of install and personnel preparation that took place for this game. Nonetheless, it would be nice to see Bradford sling it in the preseason and take more risks when the games don't count. The offensive line struggled in the small sample size of reps. Right tackle Mike Remmers was off balance and lunging when Eddie Yarbrough beat him off the edge. He didn’t have a strong base or deliver a punch to redirect Yarbrough. Remmers was falling forward and failed to even engage on the play. The slow motion version of the sack really shows how poor Remmers approached the play from a technique standpoint. The offensive line must perform better, but it isn’t time to press the panic button yet. There’s a reason this is called the preseason. Left tackle Riley Reiff will return soon, which will hopefully start developing cohesiveness up front. The offensive line will be a work in progress and the hope is that it will continue to evolve as the season moves forward. Anyone who thought the two signings the team made would instantly patch the problem wasn't thinking realistically. Guard Alex Boone struggled in this game, too. He was pushed off the ball on several running plays and gave up two inside pressures that forced Bradford to shift outside of the pocket. Boone had a solid camp, but he needs to be the anchor on this unit in games. Center Nick Easton performed well, but he wasn’t any better than average. Center Pat Elflein stood out with the second-team. He sparked a pass reception with his mauling blocking style in the second level. He also had numerous strong pass protection reps. The lone blemish came on a bad snap. This is something we saw a few times during camp, too. However, it feels like Elflein is starting to earn more of an opportunity to work with the first-team unit. Either way, the team has two centers with the flexibility to play guard in a pinch. In the second-team units, Willie Beavers actually displayed several positive reps. He set the edge for two runs and had a strong base and hand technique in pass protection. In addition, he played more physical as a blocker. However, there were still poor reps from Beavers, specifically when the game progressed. His footwork started to get sloppy and he lost by being unable to maintain adequate balance. The clip below is an example of how Beavers has a wide/stronger base and improved hand technique. Now, it's all about consistency for him. The clip above is also a sample of what Stacy Coley can bring to the table. In the receiving game, Coley continued to perform well after a strong training camp. He ran great routes to get separation and used his legs to create after the catch. Entering the league, the real question I had about Coley was his ability to win against press coverage. So far, he’s done well. He even had one grab where he won with physicality at the top of his route and circled back to the ball. Coley has also been playing with maximum effort on every route he runs, which was a problem dating back to his college career. He is developing quickly and was one of the major positives to come out of the first preseason game. It was clear the Vikings run defense was one of the biggest weaknesses in this game. The main responsibility of the defensive lineman on this team is to engage and open up gaps for linebackers to move freely and make plays. The main area that stood out on film was the need for a versatile three-technique defensive tackle in this defense. Tom Johnson worked with the starters and was washed out of plays against the run. He provides value on third down as a nickel sub package rusher and that's where he is best suited to play. The Vikings need to find a three-down defensive tackle that can be more versatile as both a run defender and pass rusher. The clip below shows Johnson getting down blocked out of the play, allowing other lineman to drive into the second level to muck up lanes for the linebackers. Luckily, there was a cheap holding call on this play, otherwise, it would have been a big gain. Nonetheless, this was the result on numerous plays where the Bills had big rushing gains. Defensive tackle Shamar Stephen has been the player many people have wanted to be the base 4-3 defensive tackle next to Linval Joseph. I still feel like he is more of a nose tackle and doesn't really provide the versatility needed in this defense. Stephen had a great camp, but in games, he is forced to play a different role than his skill-set allows. In the clip below, Edmond Robinson gets caught looking into the backfield and is too far up the field. Stephen is locked up at the start of the play and can't fight through the block, opening up a massive lane. However, the answer to fixing some of these issues in the future might come from rookie Jaleel Johnson. He is still rough around the edges from a technique standpoint, but is effective against both the run and pass. Johnson fits the mold of a versatile three-technqiue defensive tackle the Vikings need in this defense. It is one of the most integral components of Minnesota's defense. In the clip below, Johnson shows the quick burst we saw on tape along with impressive hand technique to fight through the initial block. He is still developing from a fundamental standpoint, but definitely is the future at this position. The Vikings could elect to start Datone Jones and keep Tom Johnson as a situational pass rusher. It probably makes the most sense until Jaleel Johnson completely develops over the next year. There were plenty of alignment issues throughout the first half of this game against the run. Some of the issues are up front, but the linebacker spot is also pivotal to improving against the run. Edmond Robinson had a pass breakup and performed slightly better than Emmanuel Lamur. However, Robinson was passive against the run on a few occasions, struggling to play instinctively. Ben Gedeon was exposed at least three times in coverage, but was solid against the run. As the preseason progresses, one of those players will need to separate themselves. Undrafted rookie Eric Wilson was flying all over the field making plays. He dropped an interception and allowed a few big plays in the running game by getting too far up the field. Wilson showed potential and improved with more reps throughout camp. The encouraging sign from this game was Anthony Barr's performance. He was playing very quick and got downhill when he was asked to rush the passer. He also was rangy in coverage and reactive against the run. The MVP of this game was without question defensive end Tashawn Bower. Anyone who read this website leading up to training camp knew how much I liked Bower. He has the length and speed you are looking for from a defensive end. He just needed to become more explosive and compact out of his stance. In addition, it was clear improving his pass rushing angles and arsenal of moves would garner his complete skill-set. We saw a glimpse of it in this game. Bower had five quarterback pressures, two tackles, a pass deflection, and a sack. His most impressive stop came when he set the edge and used his length to fight through a block. With the help of defensive line coach Andre Patterson, Bower is starting to refine the rougher aspects of his game. If he continues to perform like this, he may challenge Stephen Weatherly for the fourth defensive end spot. Weatherly's value on special teams may be a big difference maker, though. In the clip below, Bower wins with a quick burst and doesn't allow the offensive tackle to get inside hand position. This is the type of move Bower can make consistently. Early in the game, the defensive backfield allowed too many yards and really struggled to execute bump and run coverage. They lost several matchups where they were unable to execute their press at the line of scrimmage. It allowed the wide receiver to release and get separation to the boundary. This is a technique area the coaching staff will surely address this week in practice. Mike Zimmer even alluded to it this week in his press conference. All of the defensive backs allowed big cushions for receivers to make grabs, but it improved as the game progressed. It will be worth evaluating the defensive backs against a high octane Seattle offense on Friday. The player I was most I was most impressed with in the secondary was safety Jayron Kearse. He was very physical in run support, making two big stops. The clip below is an example. Kearse burst downhill and lowered his shoulder to get position. This is the type of physicality we seen on tape from Kearse at Clemson. In coverage, he also had one notable play on the deep half of the field. Kearse is making progress with more experience and will be tested throughout the preseason. As Mike Zimmer has noted repeatedly, he must become more fluid from a technique standpoint -- most specifically when he sinks his hips. Your breakdowns are excellent! Love reading them. great job. I am going to check here after every game.